This is my Allietare Mystery (2015) so far. I have a small handful of blocks done. I thought as Bonnie Hunter has released the fabric requirements for her next Mystery quilt En Provence (2016) that maybe I better work on the last one. I get eager to start a new quilt but I have quilt guilt that I did not finish the last one and I want to sew! So I am digging it out and hope to get more done. You can see I made a lot of changes to the colours. Now this years mystery has so many of the colours I used here (no Yellow). Quilt guilt has kept me from pulling fabric out for En Provence. I love the colours she has picked out so far, so I am sure I will do it with the rest of the Bonnie Hunter Fans. I have a big enough stash and love the colours so I do not think I need to shop for more. Maybe next week I will pull fabric. I have started 5 of her mysteries and many are UFO but one. I have one fully complete - Easy Street (2013). I did change the colour just a bit. I used pink instead of the grey. My grey was too light and I really do not like Grey. I am so much happier with this quilt. 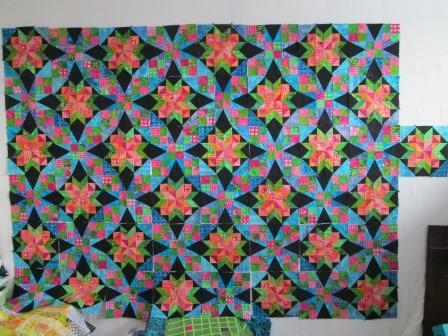 Grand Illusion (2014) is a quilt top that needs to be quilted. 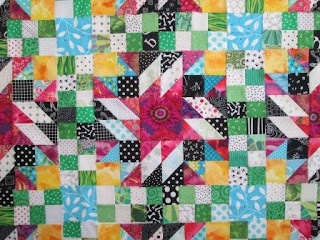 I made another change and used a magenta print in the center of the blocks and not the yellow and blue four patch units. I think I like they way the block is a more striking. I had to do some ripping to fix that as I had half the blocks done when I changed my mind. 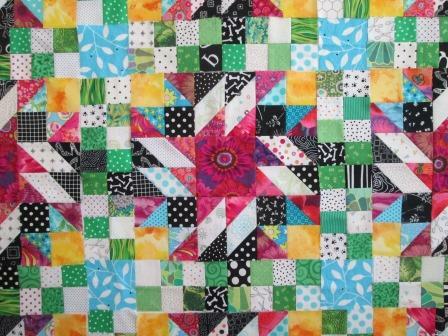 Celtic Solstice (2011) has all the blocks done but needs to be a top. I really changed the colours around. I used the black as my neutral. I started to work on the rows and got lost so I have some ripping to do to fix it. So it is back in the box and needs help. Orca Bay (2010) is a top but needs the boarders pieced and put on. It is also in a box waiting. 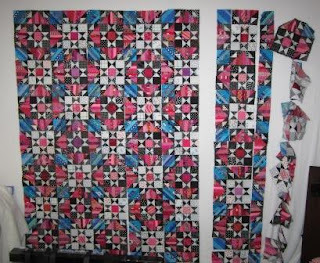 This quilt is a ton of little bits and pieces. Love ALL your color changes, Cathy! Maybe this winter we'll both finish up a couple of these! Cathy, it was fun to relive all of these. My exception is Celtic Sunrise. That was one I did not start. But I think I would have liked it more, or even started it, if your colours had been the palette. I do have my En Provence fabrics pulled and I am ready to sew. My favorite mystery so far has to be Celtic Solstice (2011). I may have to break down and purchase that pattern from Bonnie! OMG Easy Street with pink instead of gray??? I love your version!! !